Questo smontaggio non è una guida di riparazione. Per riparare il tuo iMac Intel 27" EMC 2309 and 2374, usa il nostro manuale di assistenza. I'm missing unboxing step what is inside etc. Thanks for nice work ! 1. Is there a "spare" SATA connector, and what would it take to add an external port ? From your earlier posting I think there's room on the back panel. 2. Cable management - and this has always been a bugbear on the whole iMac range - why not cut a slot in the stand to feed all cables through for neatness ? 3. Have you tested the HDMI input, and what does it look like ? Would you watch TV on this with the addition of a USB tuner ? On your pictures, is it a 24" faicng the 27.1" ? I too am wondering if an eSATA port can somehow be added. To me, that's the biggest thing that's missing from the latest Macs. I've heard about the forthcoming Apple/Intel Light Peak optical interface but nothing is going to beat native SATA for an external storage interface (no bridge/translation necessary). Yep! There it is! Bigger, wider and brighter! The comparison shots show a 20" Early 2009 iMac next to the new 27" iMac. Why is the 21.5" iMac does not have video-in capabilities? What is the difference in those two MotherBoards? What is the stock configuration of DIMMS? 4x1GB? 2x2GB? This iMac came with 2x2GB chips. Is this the complete step for accessing the RAM space to add more RAM? (I plan to add 2x2GB more.) That is, just open the access door and there it is? Yup, just remove the access door and pull the black plastic strip attached to each RAM tray away from the bottom edge of the iMac to eject the chips. Could we replace the original edge-to-edge glass for a Multi-Touch model?!?! Would it be a possible mockup?!?! It would be very nice in Business Shows to present de digital leaflet and keynotes. And at home to be just set it as enormous "tablet". the point is how to make it for a low price? how is the glas mounted on the enclosure? only by magnets? is it real glas or perspex? thanks for your answer! Hi can you describe better how the glass attaches to the frame. Is the black border on the glass metallic so it can be supported by the magnets. Thanks. I own a 27" iMac that has this edge-to-edge glass broken at left side. Monitor is still intact. I cant exactly understand how to remove this surrounding glass. Do i need to use the suction cups on the surrounding glass so to remove it from the magnets? Cause on the photo the cups are placed on the Monitor.. There have been a number of reports on the Apple forums of the glass being broken on the bottom left side. If you have an Apple store nearby, you can ask them to replace the glass (they will have to get the replacement glass shipped to the store), otherwise call Apple support to obtain a replacement machine. Actually, in both photos the suction cups are attached to the glass. The display is recessed about .125" below the glass panel, and the two components are not connected. To remove the glass, lay your iMac stand-side down on a table. Stick two suction cups along the top edge of the glass and pull it away from the rear case of the iMac. Rotate the top edge of the glass panel slightly away from the rear case of the iMac to clear the mounting pins, then slide the glass toward the top edge of the iMac to free the flat tabs along its lower edge. I think I have break the sync cable... Can anyone tell me what will be the effect of it? Thanks. I keep my tools stuck to a voice coil magnet I pulled from a 3.5" hard disk. I haven't had a problem of screwdriver being *too* magnetized, so far. Please tell me that display is matte?!! Definitely not. It's quite shiny, in fact. Darn it. From the pictures it looked matte. Ah, shite.... I wanna matte display !!! If you want a matte screen, you should add your detailed petition at http://macmatte.wordpress.com where there are 600+ detailed petitions. 24" iMacs had matte displays (model identifier iMac6,1) when first introduced (all white)...one of two reasons I haven't upgrade my 6 24"iMacs. The other reason Bluetooth full size keyboards (model A1016, white) are only available today with a USB cord. I don't have the specs on the new cabinet width, but the 24" iMac: is nearly 23" wide. A 17" wide, full size keyboard is too big to put in front of a 27" iMac? I agree on the lack of a numerical pad--disappointing. I wonder how long until someone does an indepth review of that display? LED IPS displays are $$$ especially if this one renders color as well as some of the other high displays. That makes the price of this machine so much more reasonable. LED Display - is it RGB LED? Is it side lit or back lit? RGB LCD with LED backlight. It is not an OLED display, which is a common source of confusion (OLED vs LCD, LED backlight vs CCFL). Hmmm ... my origin question was not too clear. 1. if the LED backlight uses "RGB/tri-color" LEDs or just "white" LEDs (as in the MacBooks). 2. if the LED backlight on the edge of the display or the back of the display. LG makes a 1920x1200 17.1" LCD panel, LGD01b3, with RGB LED backlight, edge-lit. The LGD01b3 display has a wide color gamut, high contrast with vivid colors but suffers from non-even backlight color (I call it "wild gamut" because I can never get the color profiling right). Cannot find any info on this LM270WQ1 LCD panel and was hoping that the Teardown guys can tell if the backlight uses RGB LEDs and if the panel was edge-lit. This LCD panel is IPS and if it also uses RGB LED, then the iMac 27" is really a price break through! But on second thought, went through the specs and never see "wide gamut" being mentioned -- so likely at this price point, it is likely just a white-LED backlight. Can you please clarify if the actual screen underneath is also glossy? Not matte? If I take off the glass, will I basically have a matte iMac? Thank you in advance! The glass and the LCD itself are both highly glossy. Thank you! One last question... Is there any way that I can take off the glass on the glossy LCD without ruining the monitor? Thanks!!! Please disregard the previous question. I just don't know enough about monitors and I dread buying a Mac with a glossy screen. I'm also interested in an answer to wkchan's question regarding whether the imac is backlit by white or tri-color LED's. Thanks! OK, I still don't think we have a definitive answer as to how the new displays are actually "lit". Has it been confirmed whether the screens are edge-lit or back-lit? Also, regarding some recent display anomalies... I've been involved in a few discussions over at Ars Technica [URL=http://arstechnica.com/apple/news/2009/1...]here[/URL] and [URL=http://episteme.arstechnica.com/eve/foru...]here[/URL]. > display from an external video source. This means "powered on and running OSX", right? So, this iMac won't become a decent second display if the logic board goes south, or after quad 2.66GHzs are no longer "fast enough" to read email on? I'm wondering the same thing. No one has done a run through of how using the display port as input works, yet. Isn´t it possible to make a mDP "HUB" by the DisplayPort connector shown on this picture? What is "led backlight sync"? I found the flat cable (display to motherboard) easier to remove (and, more importantly, to replace) if I first removed the tape from the back of the display and disconnected the cable from that end instead of from the end that connects to the motherboard. Thatd be great to have a High-resolution full-on photo of the internal at the resolution of the new 27" iMac for a background wall paper. I'm quite irritated with Apple for not providing a slot for a second 3.5" drive. They're the masters of Tight Squeezes; they clearly could have shuffled things around slightly more to add a second drive bay. A gorgeous media computer like this simply craves twin terabyte drives running in RAID. So how many fans does this iMac have? The final image with the parts arranged neatly looks like it has three. Yes, there's three fans total. One for the CPU, one for hard drive, and one near the optical drive. I second that! That would be an awesome screen background. I just upgraded my brand new iMac 27"'s processor from I5 to I7 2.8 GHZ, but must have done some mistake by re mounting it, and the screen keeps black, and makes one beep every 3 seconds. I just upgraded my brand new iMac 27"'s processor from I5 to I7 2.8 GHZ, I cant get the CPU thermostat to work, and I don't even find the connector for it. I noticed that the picture doesn't show any Kapton tape on either end of the Airport cable. Is that the way the iMac came or was the tape removed before the picture was taken? You say that there isn't room for another drive; does that also go for 2.5" SSDs? Are there extra SATA ports on the logic board for more than the single drive anyway? You could fairly easily replace the optical drive with a 2.5" hard drive or SSD. We sell an enclosure that enables you to install a SATA drive instead of the optical drive. There are no extra available internal ports that we noticed. To confirm, this enclosure is compatible with the latest Quad-Core i7 27" iMac, correct? Also, do you know of any external enclosures where I could use the superdrive once removed? Or can you recommend an external DVD burner to purchase as a replacement once the internal one has been replaced by an SSD drive? If i install a SSD instead of the optical drive, could i boot up OSX from the SSD and use the internal 3,5 HDD for media Stuff? That should work just fine. You would just select the SSD in Startup Disk as soon as you get the drive in there with OS X installed. What model WD 1TB is this one? the Caviar Black or the RE4 model? There should be a 3.5" drive with both an SSD and a high capacity HDD on it (dual SATA). The SSD wouldn't need to be that big, say 32 or 64GB , since the most active files and swap space would reside there. I guess it would only apply to the iMac though. Given how much the SSD in my MBP has sped things up, I almost feel installing an SSD in a new iMac is a necessity. You would have to downgrade the internal Hard Disk to less than the size of the optical bay HD or use the optical bay HD as the boot drive for Time Machine backups. The Time Machine backup disk must always be larger than the disk it backs up from, AFAIR. Nope, you can choose what you backup, and if it fits, it'll do it. Which 1TB hard drive is used - is it the Hitachi? And I wonder which drive they've chosen for the 2TB option? It's a Caviar Black, model WD1001FALS. Of course this would require the SATA controller to support port multipliers, any idea what chipset it is?? HI, is there any heating sensor will have to be disabled, if I replace the optial drive with SSD. I notice someone replace the HDD with SSD, then the heating sys reports error and the fans go nuts. So how about optial drive, the same? Specifically what HDD model was in the iMac? Does it have 16mb or 32mb cache also? It is a 1TB Seagate. Apple added a build-to-order option for a 256GB SSD in the 2010 iMacs, and you can have both the SSD and a 1- or 2-TB hard drive. Anyone know where the SSD goes? Can you buy a 2010 iMac without an SSD and add one yourself? This article was written about the "Late 2009" edition. The Mid 2010 update now has the option for both a Serial ATA Drive + a Solid State Drive. How do both of these drives fit into the enclosure? Has there been substantial changes to the internals to allow this? Can you add the second after purchase? The tech specs for the 27" iMac say it can be up to 365W, so I suspect the Quad Core variant has an even larger power supply. I think Apple may be talking input power, while we're talking output. An input of 365 watts and output of 310 watts is 85% efficiency, which is typical for a good power supply. Whatinhell is the second board by the PS? It's definitely something not seen before. I believe that's the backlight board for the display. Why did you ignore the Electrolytic Capacitors and their values? These caps are the components most prone to failure. This is especially true of PS built in the latter part of the 2000 decade. Somewhere around 2006 - 2008 the electrolytic capacitor supply chain was flooded with caps with a built-in failure mechanism due to being made with incomplete data from industrial espionage gone wrong. My Late 2009 iMac PS failed and its capacitors showed the physical signs of this failure mechanism. Replacing caps is easy and cheap. I had a VISIO Television that had the bad caps and failed. It cost $15 to repair a TV that originally cost just under $1,000. Are there any slot loading blu-ray drives we can replace this with? Yup, the Panasonic UJ-135-A will work just fine. Can this trik be done also on a iMac 24" - 2007 (2.4GHz) ? Blu-ray display 1080p. What is the experience indeed of watching a movie with that black bar tags? And wait I am not considering here in "FullScreen" Youtube, mobile DTV, iTunes Movies and DVD "Super" Drive. All of that might seems very "distorted" by the 2560x1440 resolution. The ATI will have to work a lot to upscale all of this. A stand alone Blu-ray might be in the works, similar to the external usb/firewire devices for the MacBook Air. Built in, they really are a "bag of hurt", as Steve pointed out. The web site says 12.7 mm while the original drive says 12.5 mm. Small difference, but could be a problem closing the case or aligning the disc in the slot. I think they were just a bit lazy with the measurements here.. look at the image of the superdrive and google the code. I'm pretty sure that it is actualy a 12.7, not .5 (i've NEVER seen a 12.5 drive.. anywhere), so it will be a perfect fit. I recommend the UJ-235A over the 135 they mention in the article too, as it can burn blu-ray discs at 4x. iTems, you're right, that's a typo. It is indeed a 12.7mm drive, so there's no difference between the SuperDrive and Panasonic's slim Blu-ray drives. If you want to burn Blu-ray (and have a bigger budget), the UJ-235 drive should work fine as well. Just installed Panasonic's UJ-235A into my mid 2010 27" iMac & it accepted a disc but that's all it's doing. Clicking 'About this Mac' then 'More Info' & the drive is detected - OS X recognises it & lists all its capabilities but can't see it in Finder, VLC or any other program. The keyboard eject button doesn't work. Tried getting the disc out using the 'drutil eject' command. The drive makes a noise like it's going to eject, but doesn't. Have you, or anyone else, installed this drive & had any luck using it. imacs in 2003 had superdrives too! Is it possible to put a 1TB WD laptop hard drive here instead? I would think you would need some sort of mounting apparatus. I accidentally slipped in a SD memory card into the superdrive thinking it was the SD slot. Does anybody know it would be possible to take apart the superdrive? The guide to remove the optical drive can be found here. Please do not use this teardown as a repair guide, as there are many many steps missing. As explained at the top of the page, "Teardowns provide a look inside a device and should not be used as disassembly instructions." A guide for opening up your optical drive can be found here. Hope that helps! "feat of wire"? That's quite feat! A nice deconstruction as always. Hahaha step 23 had me in stitches... the Apple logo now serves as a secret antenna for wifi. Just a thought... My Unibody Macbook Pro has a fairly enclosed design where is the wifi antenna inside? 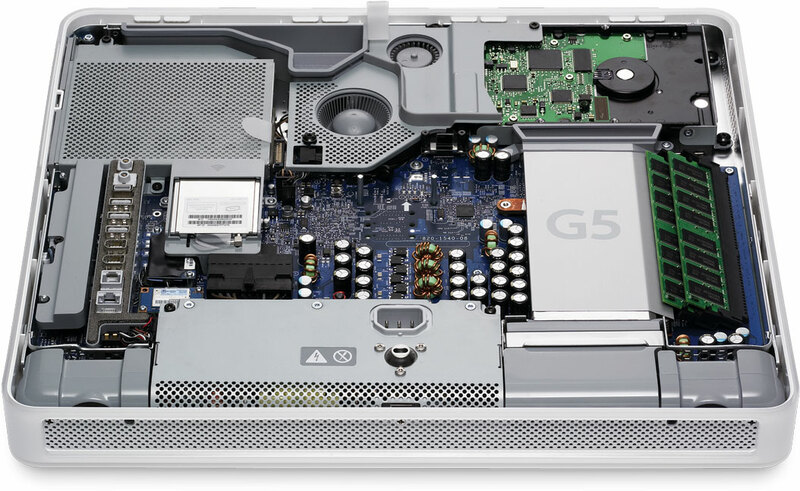 I think its a shame that Apple have neglected the stunning internal design of the early iMac G5s!... they were a work of art inside. But now... theres all this cable and clutter... I wouldnt mind if they made the imac less tapered on the back (it'd still be the thinnest and most stunning all-in-one) if they would make better cooling and repairing easier with the internals better laid out. Still love the new iMac tho! If it's anything like the original Macbook Pros, which I used to be a technician for, they wrapped the antennae cables around the edges of the screen. Since those screens are now 100% glass, I wouldn't be surprised if they left the wires there since it's the only part of the system not made of aluminum! just curious, after pulling this baby apart, how would you rate its value on a parts basis? In the iFixit teardown of the unibody MBP, they mention that the wireless antenna is located in the black plastic display hinge. Equally gorgeous on the inside, a Black PCB, very classy. Yes, it is/was a beauty to behold, but that was largely due to the fact that there were several "user installable" parts. For example, midplane board, hard drive, RAM, etc. Funny thing is that people still needed help simply installing RAM! Apple rethought this strategy, because subsequent iMac models did away with this clean internal design (and so many user-installable parts). First of all, you must be easily amazed, because Apple has always had higher premiums on their components. They can only leverage their monopoly on stuff like NAND flash memory prices. Not a "magic" WD hard drive, but neither are the Seagate drives (their other drive supplier). Apple generally maintains more strict product tolerances from vendor for things like RAM latency, hard disk burn-in and MTBF. This usually means Apple staff "qualifies" goods before getting them into your hands. This adds to cost--esp if Apple has their own special recipe of firmware to drop onto drives (e.g. server-grade drives). All Mac users missed the myriad adverts touting "2TB hard drives only $179! ", because we're ignorant Mac zealots. You can go back to building your frankenstein PC--complete with blinky blue/green/red UV-lighted case mod and we'll stick with our stupid Macs. Maybe you should remove this site from your bookmarks and/or Google search history, too? Oh, wait... you're a web troll--it's your job to categorically dismiss "stupid" Mac users. I guess your mission is accomplished. &&!&! The term PC does not mean windows bud. You forgot about linux, mainly, Ubuntu. Rock solid OS, OPEN SOURCE software that is community maintained, and the speed to run circles around any mac of equal spec, all with a flexibility and low price of building a PC one part at a time. YOU can choose exactly what goes in it. @Chris - the intent of my post was to take the pi$$ out of what appeared (to me) to be Mac flame-bait from. "Mac zealot" was a self-depricating reference to steal Joe C's "thunder" if/when using said term himself. The point is that life is not as black and white as "I'm a Mac"/"I'm a PC"--as Joe C insightfully points out in his later post re: "PC" definition. Apple's and Microsoft's ad campaigns try to stoke this outmoded argument. We know how common it is for people to work on Windows PC at the office and Macs at home. But "PC" statistically refers to Windows PCs (given the slight market share Linux has). (Reasonably) technically savvy users reading/posting to this site should be somewhat aware of how versatile, lightweight and supported different flavors of Linux can be--compared to Macs and/or Windows PCs. Nevermind . . . this a waste of everyone's time. Sorry for the trivial distraction. Thanks Joe C. Happy New Year. What’s that center fan called? The one under the hard drive? Is it possible to drop in a quad core later? I am thinking about getting this one and dropping in the quad later when I have the money. You mean this thing has a generic-sized portable graphics card that can be swapped with something else? Brilliant. Should have shipped with a 1GB card at least. I really hope so. The graphics card it the only thing that is stopping me from getting one right now! There's not that much difference in price between the two - I think you're better off getting it from day 1. Is there any mini-DisplayPort "chip" controller? I mean what differer at Mother Board, in order to not allow video-in at the 21.5" iMac. I really want to now!!! What is the specification and model of the mDP? Is it mDP 1.0 or 1.2? Is it compatible to the HDMI 1.4, yet? What's the chipset used in the Core2Duo logic board? There are quad core chips out there that are not i5s or i7s. I am just as curious what is the socket type, if it is a LGA 755 type I could see the potential to put in a Q9550S. I so want to drop in a Q9550 into my new iMac. If it weren't for that warranty voiding sticker.. Anyone want to try? In theory it should work. Works in my Hackintosh just fine. Can we put a extreme i7 in the quad core model??? and how about a ATI Mobility Radeon HD 4870 X2 in place of the existing 4850 card?? Oh, a wonderful idea! I'd love to see the iFixit folks give this a try and report on the change in performance. Then they could sell us the proper CPU and provide the instructions for accomplishing the task. Does anyone know if there are any mainboard (off the video card) graphics chips (e.g., scaler), or are the DisplayPort signals routed directly from the GPU to the LCD panel and DisplayPort connector? After looking at the CPU specs in detail for the E7600 and E8600 C2D parts and comparing them to the various available C2Q parts, it seems to require one of the 45nm QxxxxS parts to even have a chance of working, with the Q9505S or Q9550S being the most likely of the higher-end ones. The power regulator specs/etc. are different for the non-S parts. I'd be happy to try it, pretty sure the worst thing that will happen is that it won't boot due to lack of C2E (Stop-Grant) support or confusion about having 4 cores instead of 2. It could also come up but refuse to recognize the other 2 cores. Hmm. Is a Q9550S CPU the only thing that you are lacking? Hi is it possible to replace the USB ports on this Mac? I have 2 dead out of 4 and its driving me crazy!! "View high resolution shots of the front and back." Sorry, but those "front" and "back" links are dead. Please update with new links. Those are very important photos. Thanks. it's possible to remove graphic card and replace it with the same but 512mb vram? I'd be interested to know if you can replace it with a better one. You say these are generic parts? Where can we get them? Or are they only available to manufacturers? I really want to know if this is true!? i need to upgrade... bad. So is that still a laptop card, or like the proc, are we getting desktop class cards now? I agree! You never take the heatsinks off! Come on! What's the name of that supposedly standardized slot? I've only ever seen Apple use it; I recall it was the same in the previous two revisions as well. I don't get it. On this model you can change the graphic card? so is it possible to replace graphic card in any 27 inch imac? Does anyone know what size the counter-sunk screw are securing the GPU heatsink? I snapped one over the weekend doing a teardown to redo the thermal paste. Thoughts on what you do if the case for the Pram battery gets disconnected slightly? Hi, I recently change the logic board of one of this imacs, and never starts MacOS... Always stay in the apple logo... And It's extremely hot on left side (powersupply)... Some ideas? Update1: The repair COMMAND+R Works, open the Disk Utility the Machintohs HD doesn't mount... Serial info problem?? Can anyone confirm if it would be possible to feed a SATA cable into the Memory Door area, thus allowing the cable to exit via the memory door opening? I can't tell from the pictures if there is enough room to get the cable into that area and then out the door. Obviously with the door removed the cable would feed out so it's more a question of getting the cable into that area. Then I could modify the door to allow the cable to feed out while still remaining closed. Apple has the option for both a Serial ATA Drive + a Solid State Drive. How do both of these drives fit into the enclosure? Can you add the second after purchase? That would be interresting to know. Sounds like it would be quite easy to add this SSD later. Anyone still here? Need to get out of the grey screen! Just curious if anyone has ever taken apart an iMac and used it's guts to create another pc without the internal display? That's an interesting idea (forget the internal display and use the rest in another case with a stand-alone display connected through the Displayport/Thunderbolt port). Just so happens I have an iMac with bad internal video (black screen, only two LEDs on motherboard lit). I'll try plugging in a Displayport display I have here and, if the unit actually works, I'll start the disassembly and re-packaging using a spare PC case I have in my garage. Nice project idea! Thank you for details and wit. • Step 5 - yah, I found the magnet that's in the upper LH corner by accident (I use it to hold documents with a paperclip when I need to reference them when typing..). • Step 7 - Yes, the screen is VERY glossy! Contrary to some beliefs re: placement of a desk, I tried placing my desk such that I'm facing the door, but my back is to a window.. turns out that I don't miss out on seeing what's going on outside after all. Would a screen from a 27 inch 2009 fit on a late 2013 model? is there anyway I could order all of the components to a 2015 imac retina 5k and install them into a 2010 27 inch model? I'm trying to remove the stand but my screws got stripped. Is there's anyway to take the stand off from the inside? ?